Meet Nick Jones: An Employee With Down Syndrome At Park Cities Ford. You are here: Home / Resources / Down Syndrome Resources / Meet Nick, A Car Dealership Employee With Down Syndrome! As a father of a five year old with Down syndrome it really gives me hope to see businesses like Park Cities Ford hire people with special needs. I was back at the dealership recently and saw Nick still there working and having fun with other employees – and I was proud! 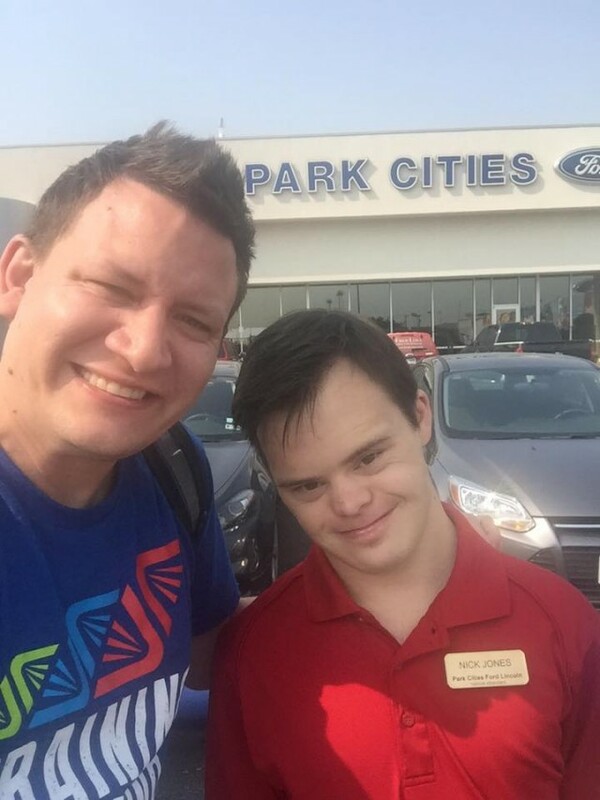 I hope more companies follow Park Cities Ford example and give people like Nick (and Noah) a chance! Way to go Park Cities Ford! Check out the short video below for more on Nick’s story, or read about it here. What did you think about Nick’s story? For those of you with children with Down syndrome how do you feel when you see stories like this? For everyone else: what companies have you seen that hire people with special needs? Leave a comment below and let us know. Makes me wish that we lived in the Dallas area so that we could do business there too! Gives me even more hope for our 9 yo son who happens to rock an extra chromosome! Hey Rhonda, thanks for the comment! Where are you guys located? I’m going to publish a blog post soon on various employees that hire people with Down syndrome / other special needs. I shared this post on our Facebook page and asked our community if they new of other companies who hired employees with special needs and had a good number of responses. I think it would be interesting to compile a list. I know Walmart hires people with Down Syndrome. I worked with a guy that had it back when I was in high school. Maybe your son would like to work there someday. Bravo Nick! I’m happy for You and hope one day my son is going to have job and to take care of himself. It is not cool to go up to someone you don’t know and ask them if they have DS. Some people with DS – but not all – don’t take pride in having a condition, would rather not have it, and are embarrassed about being visually identified through facial ‘stigma’ and other clues such as shortness of stature. Hi Rob – thanks for the comment. I actually didn’t go up and ask if Nick had Down syndrome. When I first noticed him working he is a little ways away, and as I got closer I could tell that he had Down syndrome. It would have been nice it Nick would have been interviewed, also. Keep up the good work, Nick! Yah, that’s a good point. Not sure why they didn’t interview Nick, but none the less it’s a pretty cool story! Angela it sounds like you really know your stuff when working with people with special needs. Bravo to you and the dealership for making this young man feel so comfortable and wanted. I wish there were more like you all in the world. Loved it! My daughter is11 and i know she will do great things some day! This has given us hope that our eighteen year old son may some day find employment. I always notice the employees with DS and other issues working at my local Target andwhole foods, way to go!!! My hope is to create a business for my grandbaby to run and own someday. This post gives me hope for my 2 my year old son with DS . Things can only get better for him. Though we leave in England where people with disabilities get disability allowance I will want him to be able to work and take care of himself one day. how inspiring. thank-you for sharing this. how about noah? and the baby. love to see them and your beautiful wife. Nick’s story was beautiful and inspiring!!! Makes me want to fly down to Texas and meet Nick and purchase a Ford?? and I’m not a Ford fan but that dealership and the employees there ROCK!! I have a beauty that’s 3 years old and she will be proud of who she IS!!! Down Syndrome isn’t who she is…it’s just the condition she HAS!! SHE’S BEAUTIFUL,SMART,SASSY AND A TOTAL DIVA! She will be that one young lady that will be happy to say…yes, I have DS BUT it doesn’t or hasn’t stopped me from being INCREDIBLE ME!!! Thank you for awesome posts. It is so nice of them to give him a chance, wish more companies would follow there lead. My daughter Jennifer works at Sonic and has been there for 8 years she does the courtesy tray and puts the items in the bags for the meals. Over the past two weeks I have enjoyed following you and Noah and anxiously waited for your next post! There was so many great posts to choose from but this is the one that really pulled at my heart strings. Inclusion is important and like you, I was very excited and happy to learn about Nick and all the opportunities he has been fortunate to receive. It’s stories like his that gives us hope for a better tomorrow for individuals with developmental disabilities. Nick is a very admirable person. I look forward to reading your future posts and joining Noah’s journey. I can’t wait to see where the places he will go! I look forward to reading your future posts and joining Noah’s journey! I found out there are jobs in Europe in special theaters, dance groups etc. for young adults with DS. As I know these groups can’t pay for themself so they are almost completely “government funded”. In my opinion, these is a big problem for people with Down Syndrom, in these case they are pushed into something, they can’t fulfill later. They won’t have a chance to got a job as actors outside from these special theater, but once government stops funding these project, what will they do then? They have an official profession as “actors”, and than they should sell sandwiches at IKEA? I like the story about the young guy at the Ford Dealer, and I wish I could see in my country (Bavaria) more people working in the public with DS. (actually I never saw one). What do you think about such “jobs”? Or do you think I am completely wrong?